When I first started out, this usually meant I was fumbling through the mix looking for all the various busses, delay aux returns, wet/dry mix knobs, etc, etc. But alas, no more! 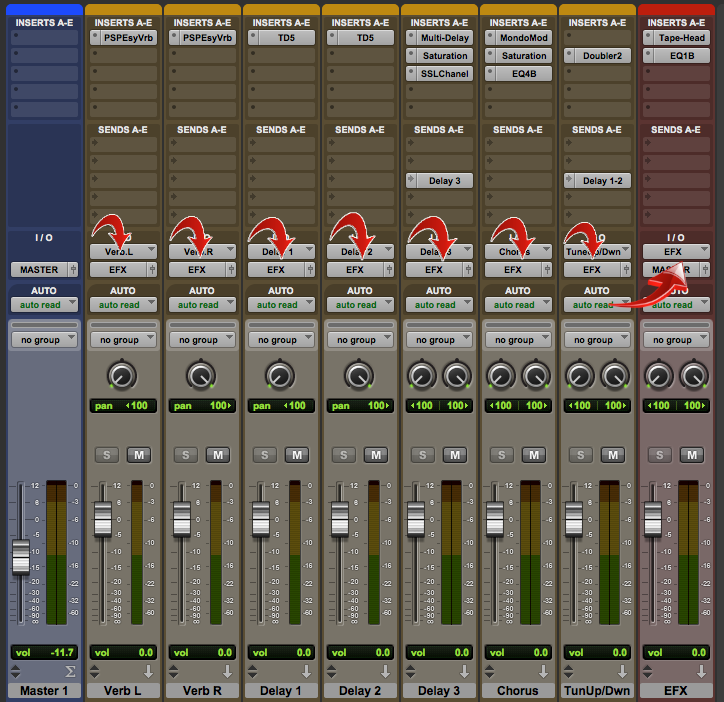 Today’s Quick Mixing Tip: Route ALL your effects through a master effects aux return. This trick is ridiculously easy but can save you a whole lot of time and effort. Let’s re-visit the above scenario. The client wants the mix drier overall. In about 5 seconds, I can go to my effects master aux return, turn it down 2-ish dB, and I’m done. That sure beats the other options! All the effect returns get routed to a master effect return for easy control. On top of having easy and quick control over all your effects, you can do blanket EQ (or otherwise) plugins on this track. My favorites are to have a high-pass filter cutting out the mud of all the effect returns or adding some harmonic distortion.